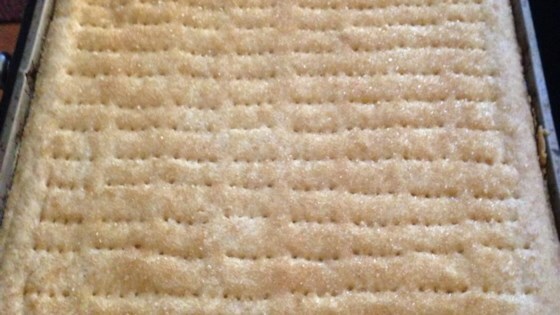 "My mother is from Scotland and this is her authentic Scottish shortbread recipe. It makes bars, not cookies!" Press into a jelly roll pan. Prick to bottom all over with a fork being sure the fork hits the bottom and the pricks are close together. Bake for 10 minutes. Reduce the heat to 300 and continue to bake for 40 minutes more. Wait 2 minutes then cut into finger size bars. Cool thoroughly in pan. Great recipe - much like my grandmothers. I reduced the flour by 1 cup and added 1/2 tsp vanilla. Turned out less crumbly - just perfect! !